Social media networking has become a wonderful tool to help get rescue animals adopted. Or pulled from high kill shelters to animal rescue groups where they don’t have to die to make room for the next animal. Facebook is how I got involved in animal rescue. I saw a dog listed for adoption, from a group I had never even heard of. I adopted him, and a few months later Ozzy came to our attention through Facebook also. Two years later I was fostering for that animal rescue group. Five years into fostering and I work with a few different animal rescue groups. And every one of them uses social media to help network the animals that they have for adoption. A lot of them even go through the Facebook “Flea Market” pages looking for “Free to Good Home” ads, to rescue those animals too. As we all know that bad things often happen to “Free to Good Home” animals on Facebook or Craigslist, etc. It is a great way to network for the animals. Getting the general public involved in the networking is great. So many people share that posts, so they get seen by hundreds or thousands more people. It gets the animals adopted a lot quicker, the more people that see them. Yes, it also leads to more “Out-of-State” adoptions too. The one rescue group I work with just had a family drive over 8 hours each way to adopt a dog. Networking through social media is also a great way for people to get involved with animal rescue, without volunteering or fostering. Just about anyone who has a social network account can hit the share button and put that animal in front of hundreds of more people. And with luck, a few of those will share too. But there is also a downside to the networking. Having to dig for the information. Often times people forget to put the animal’s location, and contact information right up in the post part. Then it gets lost in all of the comments. Making it take much longer for those of us trying to help, to find the information needed. And for the most part, the comments aren’t helpful. 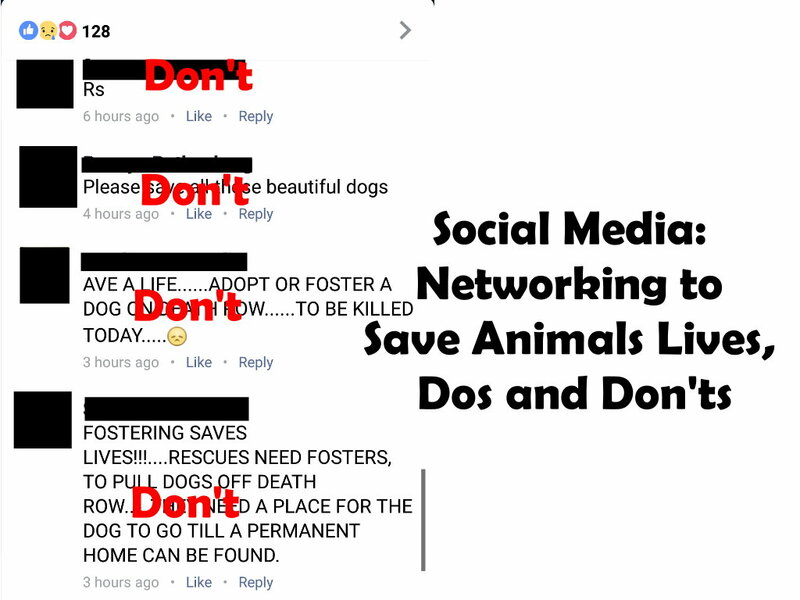 So a few rules of thumb on networking for rescue animals on social media. DO: Make sure the animal’s location and contact information are clearly visible on the post. This is the most important part of networking. Making the contact information clearly visible is a must! DO: Always share the original post. Don’t copy the picture and text, and make it your own post. It makes it harder to ferret out the correct information. Typos happen. DON’T: Leave unhelpful comments. Things like: “Please, someone help this poor dog” or “If I had room I would take him” or even “shared”. Yes, we understand that you would like to help, but can’t, and you want everyone to know that you wish you could. But these comments are pointless, and they clutter up threads for the people that are trying to help. Or to find out if the animal still needs help. It is really time-consuming to read page after page of useless comments trying to find more information. DO: Add updates as available. If you see that the animal has been adopted, rescued or otherwise, make an update. Hopefully, the original poster will update the post accordingly. But if not, update your share of it. That way everyone knows that the post doesn’t need to be shared more.